Today was extremely rainy and windy, and to add to the gloom, I had a headache all day. Luckily, I had started this woven ribbon heart yesterday, so it was easy to finish it this afternoon. Another wonderful, cut paper heart from my friend, Elaine. came back to her light-filled, art-filled home and chatted for another two hours. Ah, the joy of a very good friend! Hope you've had a great day, too! 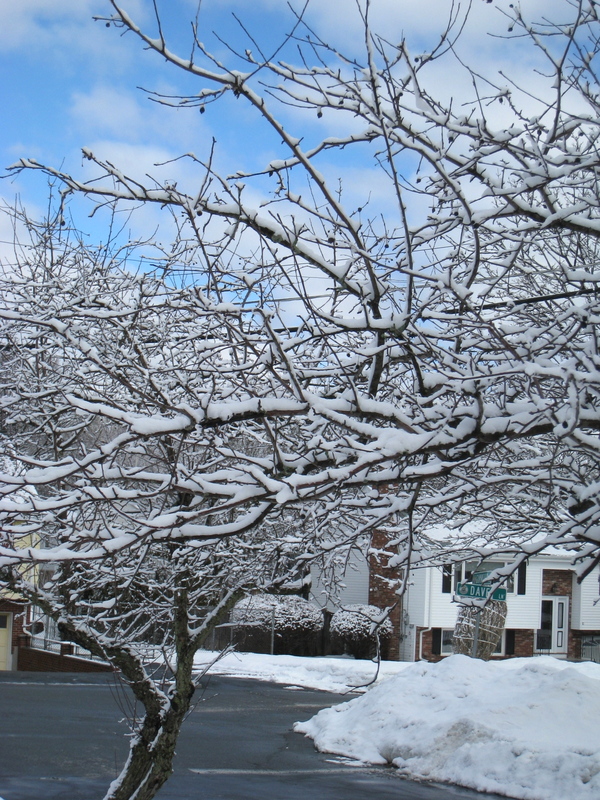 Although we've had plenty of snow this year, I've missed the "icing" effect that I love so much. I'm glad I took pictures early this morning because, already, melting has left the branches bare again. For today's heart, I decided to make a flower with heart shaped petals. 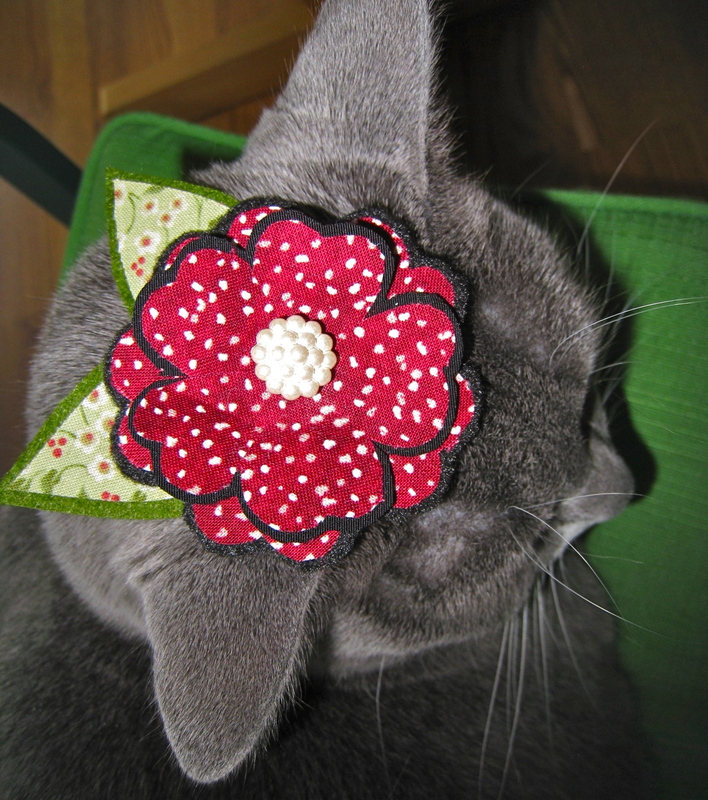 which can also be used as a hat for Rosie!! 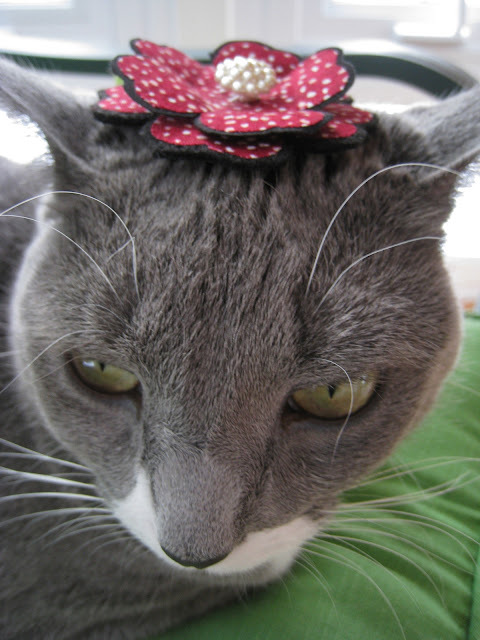 I can tell that she feels very pretty! Hope your day is a good one!! Today's clever hearts were made by my dear friend, Elaine. pieces by her active "participation" in the process!! A doodle with a heart! into an ATC and traded it. I should really make it again to keep. Hope you are enjoying your day!! left my back porch for the day - right in the nick of time to take a photograph! One of my goals for this year is to improve my hand embroidery, so this is a start. I'm enjoying my theme for this month - hearts are fun to do - and I'm thinking of setting a theme for March. I'm actually excited each day, thinking about what I'll make and being excited by creativity gives me a little buzz. Of course, I'm also doing all the things I usually do, but in the back of my mind, I'm looking forward to the time in the day when I can sit down and create. A very nice way to spend the winter! Yes, I'm planning to make hearts until the end of February! 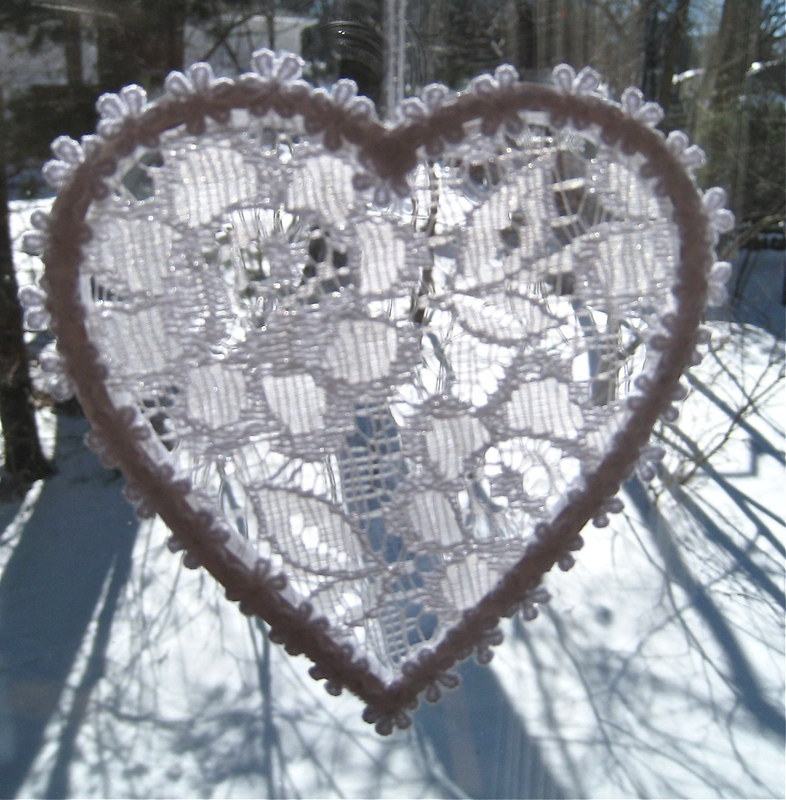 This is a lace heart, with a lace trim, which I made this morning. with a suction cup. If and when I find it, I'll take another picture! Snow is falling again today, and the kitties are huddling together for warmth! 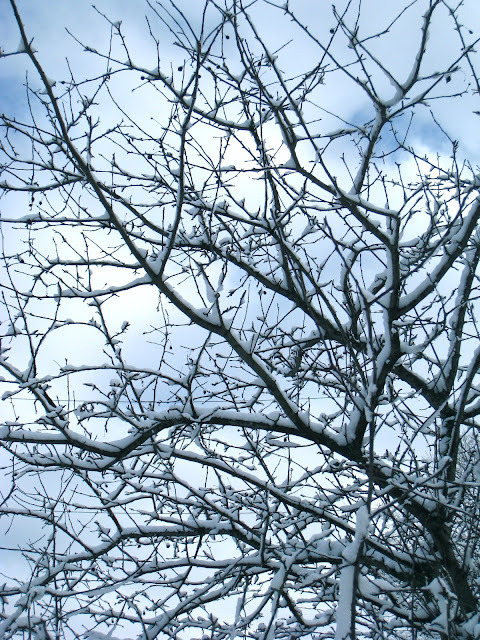 It seems like another blizzard like last weekend's, but we are told we'll get less than 6" of snow! Today my husband (my random number generator!) drew names for the heart giveaway. I'll decide which heart to send you, so it will be a surprise! and I'll send your heart out this week!! Thank you to everyone for your lovely comments this month! Yesterday I posted about my heart giveaway, which you can enter until this Saturday, February 16. Today I am so happy to be able to share two hearts which were sent to me by talented friends. 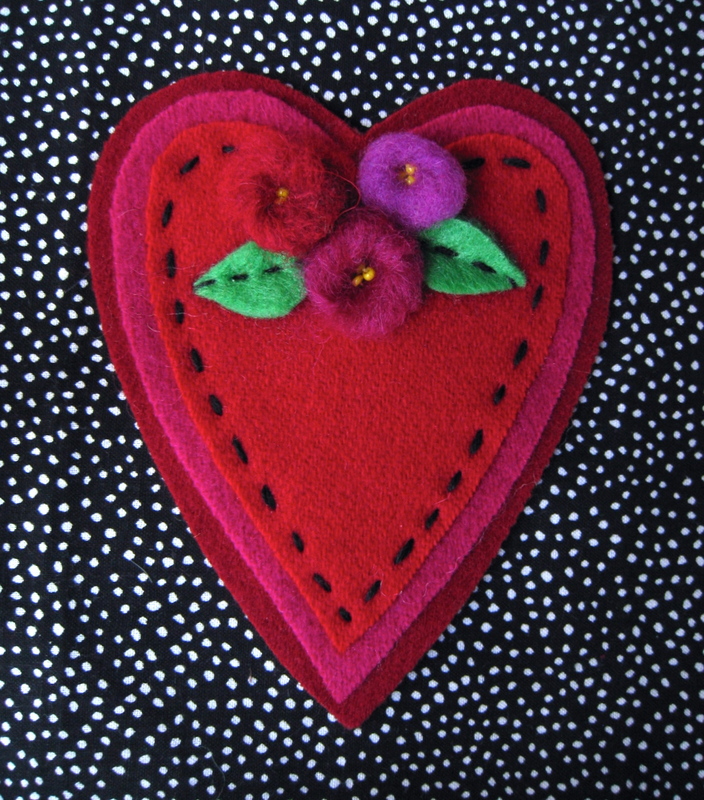 The first is a heart made by Karen at Sew and Sow Life. I love this photograph! 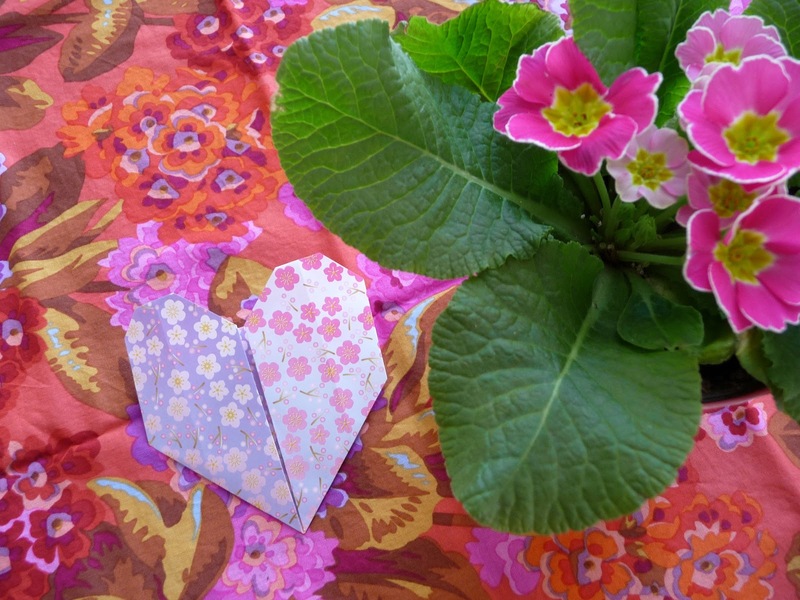 She also included directions for making this origami heart and it looks fairly simple. 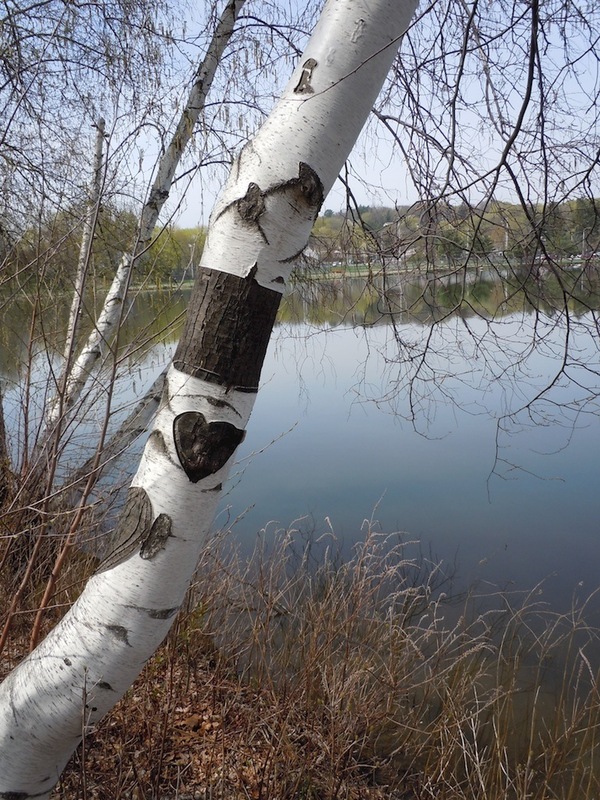 with sincerity and depth about living a simple and meaningful life. 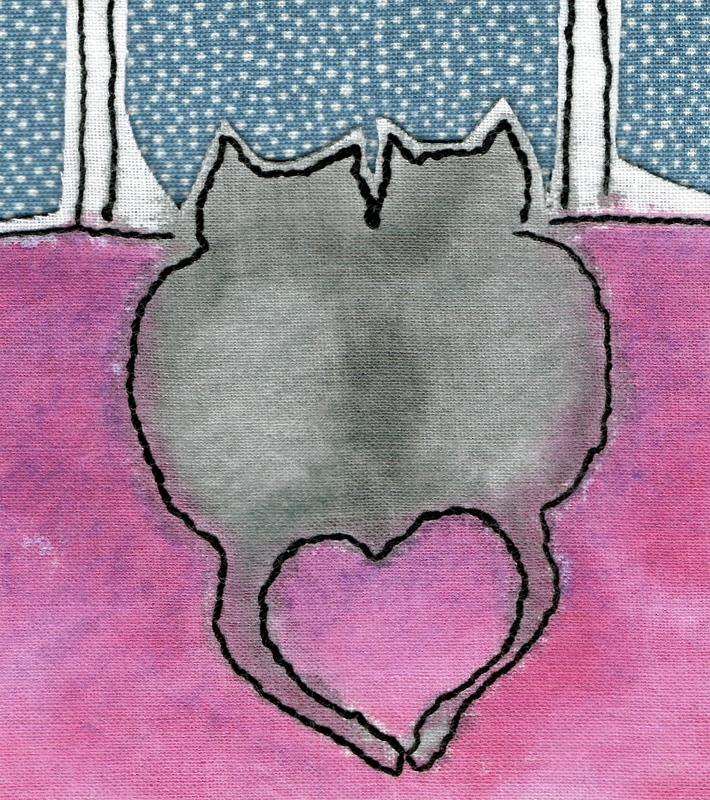 The second heart is a watercolor painting done by my friend Nancy at Furry and Feathered Friends. 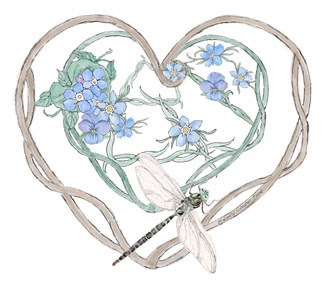 Nancy does beautiful paintings of nature, birds and animals, as well as lovely custom pet portraits. 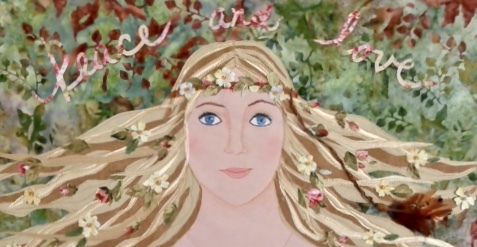 Nancy also has other art blogs and a website showcasing her gentle illustrations. 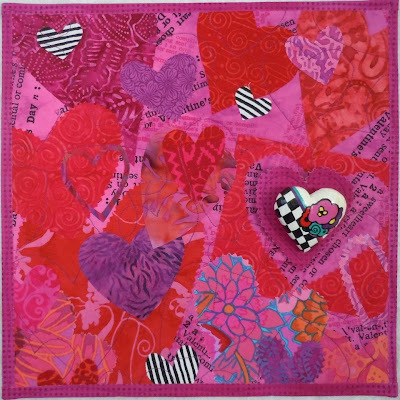 and I've loved showing hearts made by friends. Now it's time to begin the giveaway I promised! These are the hearts I'll be giving away. except for the paper heart at the bottom. If anyone else would like to be included, just leave a comment on this post! Winners will be drawn this Sunday, February 17! by friends, to share tomorrow! 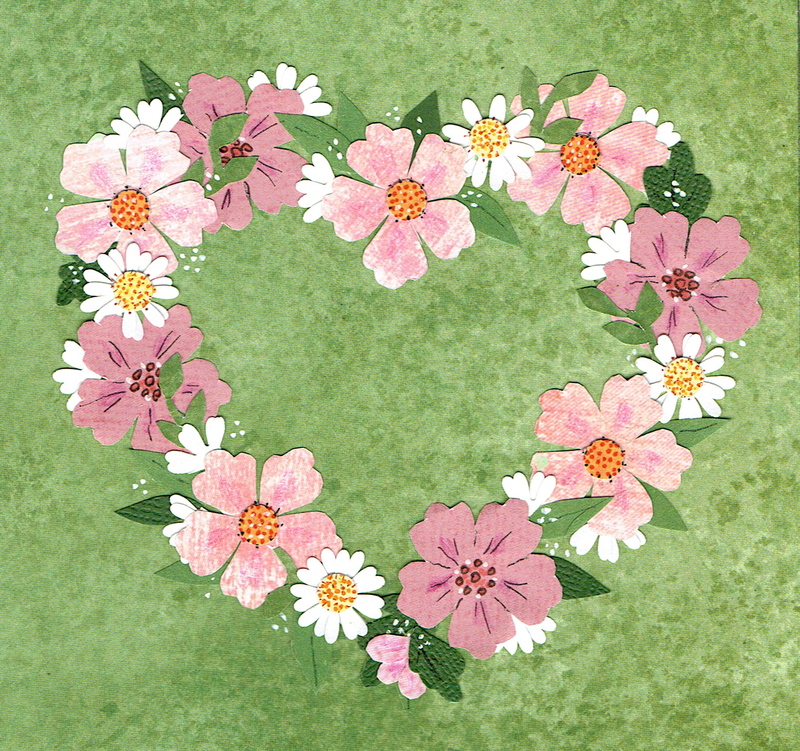 This heart is recycled from some ornaments I was making in December. I was able to give it a kind of Victorian flair. 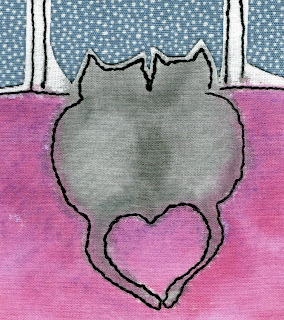 This making of hearts for February has given me the Winter lift I was hoping for. 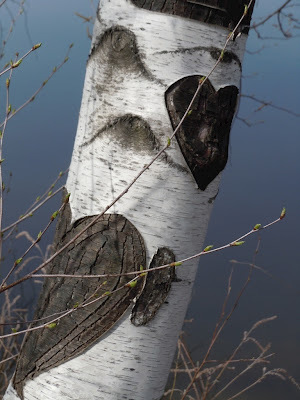 Hearts do not always have to be red!! So happy to see the sun today!! Temperatures in the low 40's!! Today I'm sharing a couple of heart-themed doilies made by my friend Sharon. 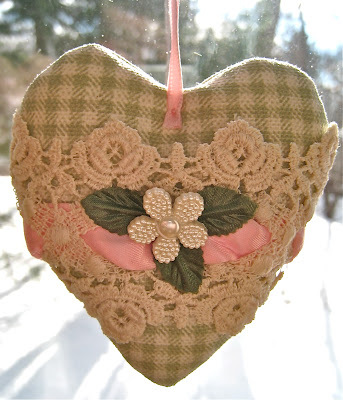 And this heart ornament is so pretty, with thicker thread and a scalloped edge. It makes me want to learn how to crochet!! 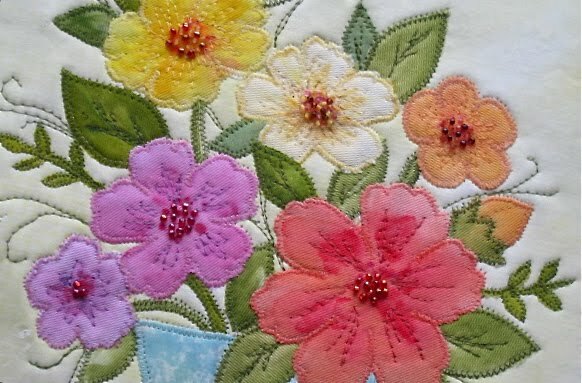 Thank you so much, Sharon, for allowing me to feature your work! We have freezing rain here today and mile high snowbanks!! Just returned from doing errands and will stay put for the rest of the day! 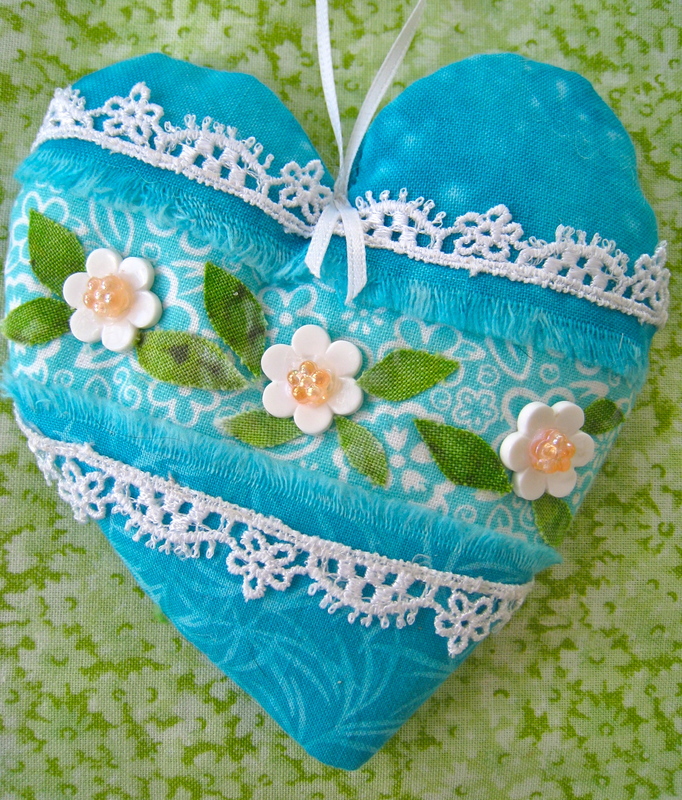 Today I am so happy to show you a heart made by my talented friend Barbara. 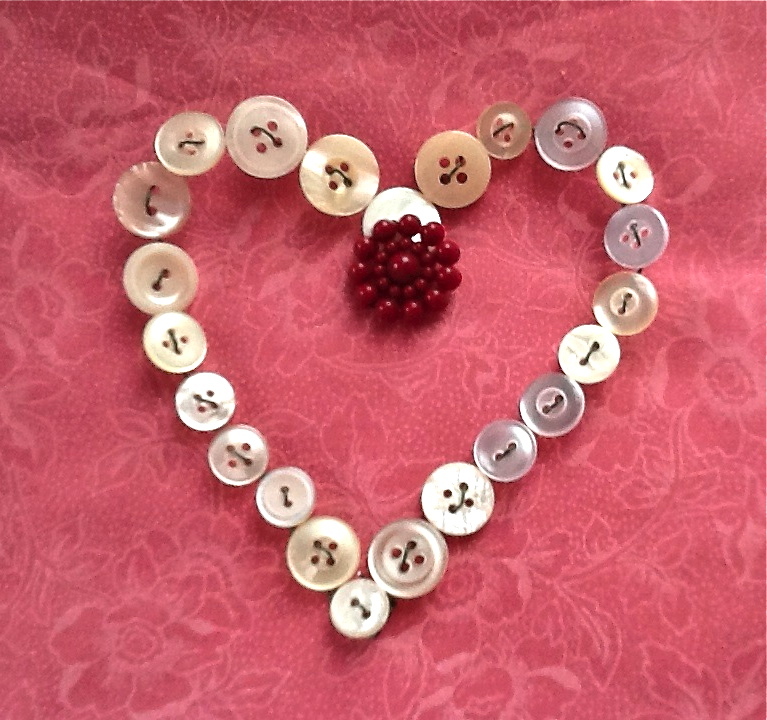 She created this button heart with buttons from her extensive collection, threaded with wire - so pretty! Today is sunny but cold here - literally, the calm after the storm! Hope you are having a terrific Sunday! This seemed like an appropriate heart for today!! We survived the blizzard, with no problems, other than the 2 1/2 feet of snow everywhere! 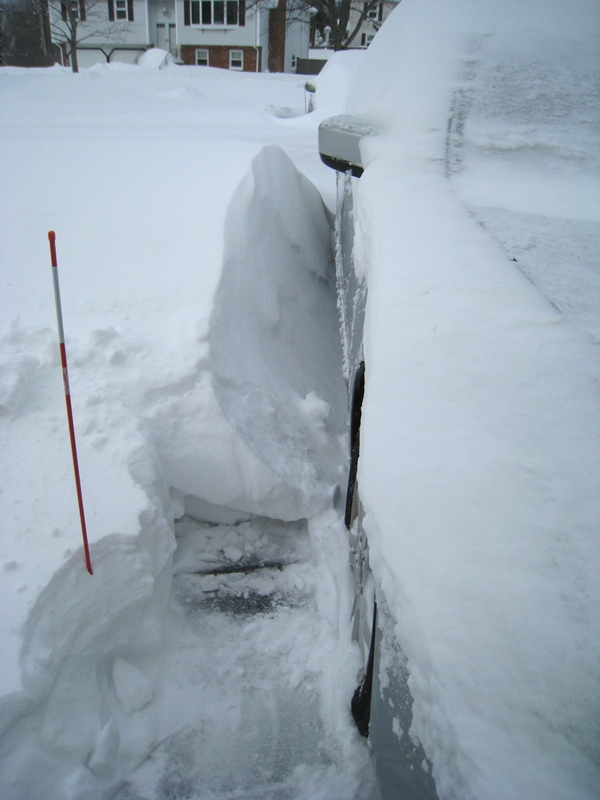 We have a long driveway, and my dear husband did most of the removal with a snow blower, and I did a bit of shoveling - not very much, as I've been having pain in my wrist and hand lately. I took this photo last night, through the screened window on our porch, when the wind was howling and snow was falling heavily! Quite a sight! We were lucky not to have lost power! Well, I hope that everyone else who was affected by this blizzard is doing well and that all are having a very good weekend! Today I'm sharing a photograph by Andrea of a weathered window shutter in beautiful Rockport, Massachusetts. This is a charming town in Cape Ann, not too far from here. Have you heard that we are experiencing a blizzard here on the east coast? Actually, although it has been snowing all day, this is the least of it! We are supposed to have heavy snow and high winds all night and through tomorrow, resulting in about two to three feet of snow! 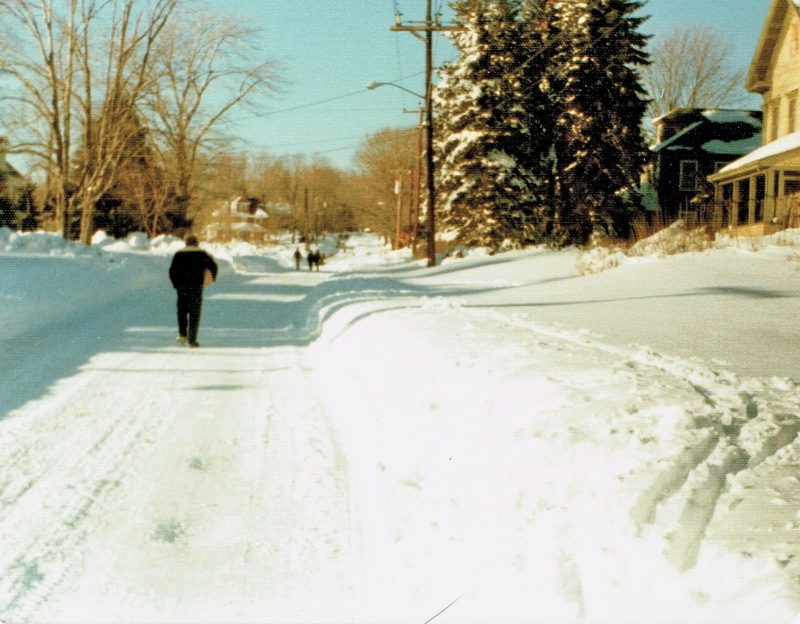 This brings to my mind the historic blizzard of 1978, when my husband and I were first married. We lived in an apartment in an old home on a busy highway in Massachusetts. I can't find many photos from that storm, but this one was taken after it had ended and people were walking down the highway as though it were a country road! We are stocked up with everything we need. Our governor has asked that all but emergency vehicles stay off the roads, and I'm hoping that we don't lose power. Towns right on the coast are expecting a lot of damage, so we're sending our best wishes to folks living in those areas. Meanwhile, I'll be making more hearts, and hope to post more of them soon! wreath a while back, but I added more details and a bow to it yesterday! Meanwhile, Andrea sent me these photos of a birch tree near the lake in our town. I'd like, but I'll definitely wear it on Valentine's Day! 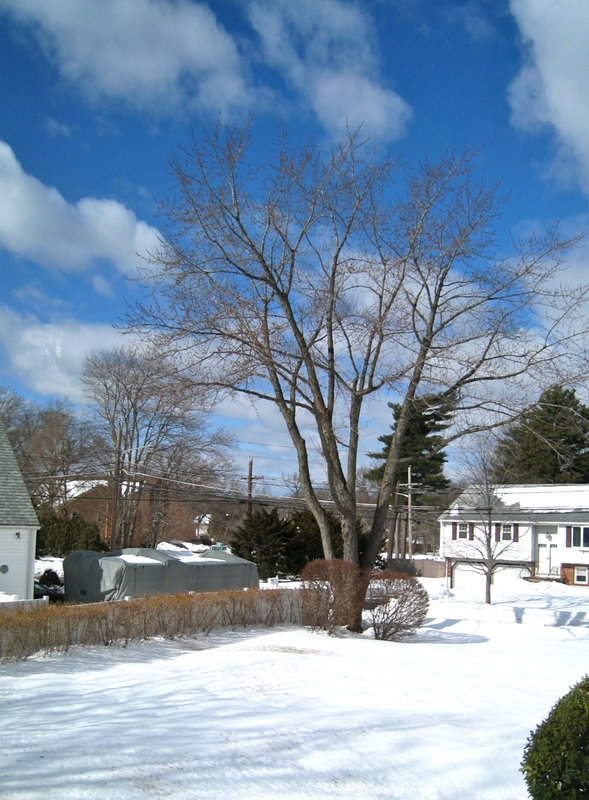 Today is a sunny, very cold day here in New England, and I have two hearts to share! 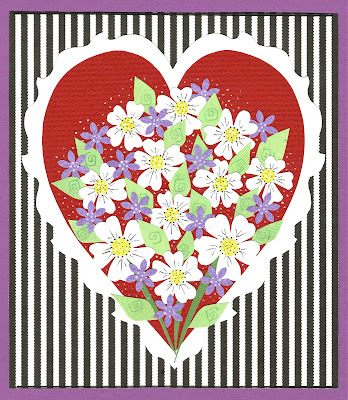 This morning I completed this cut paper heart, using papers from my stash, along with Sharpie pens. And here is a wonderful 12x12 quilt called "Be My Valentine", made by my friend Andrea. 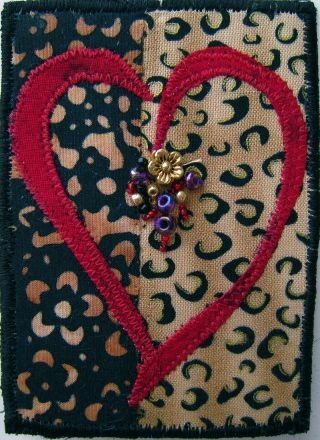 She also hand painted the heart embellishment. Don't forget - I'd love to add your hand made heart to our collection! 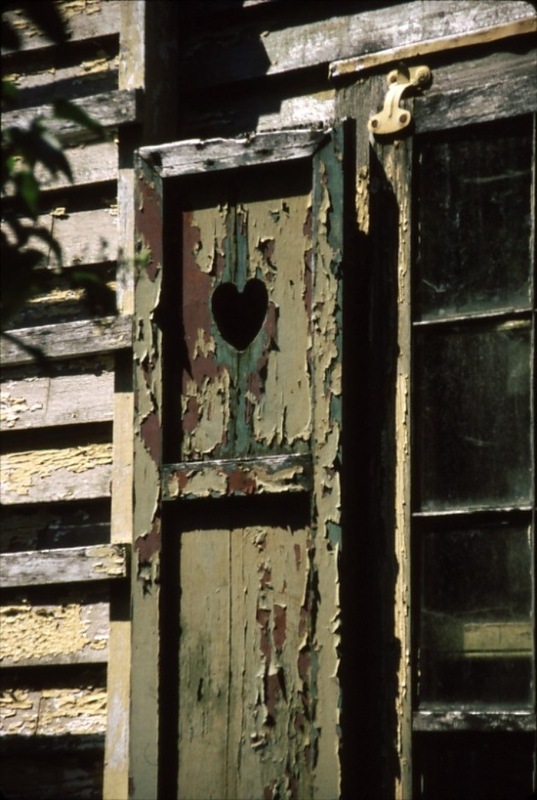 Create a heart in any medium. Post a photo of it on your blog (if you have one) and email the photo to me at judyeh(at)comcast(dot)net. If you don't have a blog, just send me a photo! I will post your heart on my blog and on the Pinterest group blog, with credit to you. You're welcome to contribute one heart during the month of February, or as many as you'd like! Later in the month I'll have a giveaway of a few of my hearts! taken in France by my friend Andrea. 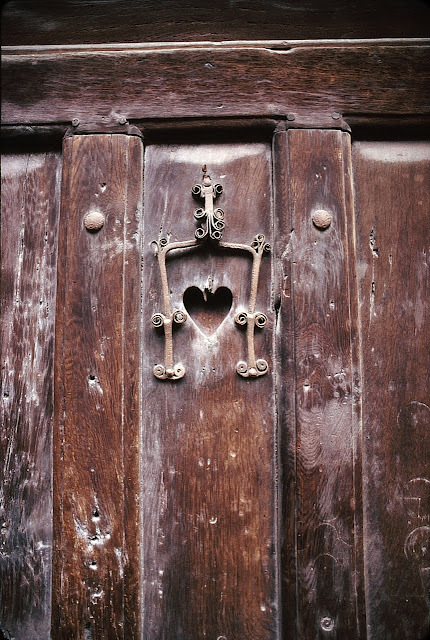 I love the age-worn wood and beautiful metalwork on this heart-graced door! I'm showing hearts all month, and would love to include yours! 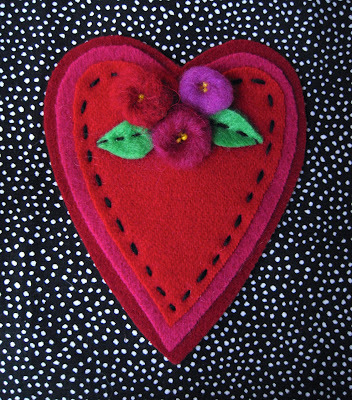 Perhaps you've created a hand made heart in the past, in cross-stitch, quilting, pen and ink, watercolor, felting or some other technique. Or maybe you've caught an intriguing heart in a photo like this one! Pink felt heart by Judy, with plastic beads I bought years ago!! just waiting to be brought to light! summer bedspreads as kids, my mother's "rouge"
I'll be making hearts all month, and you're invited to contribute, too! 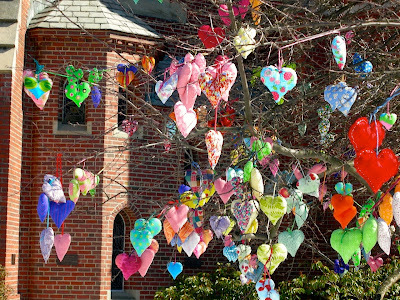 Toward the end of the month, I'll have a giveaway of a few of my hearts!! Heartfelt February: An Invitation and a Giveaway! February is often a dreary month for me, so I decided to perk it up this year with a theme - handmade hearts!! I'm also extending an invitation to my readers to join me in this challenge! 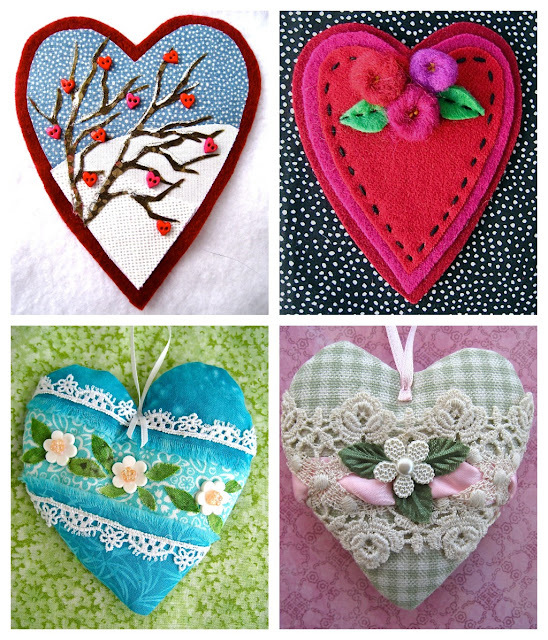 Hearts will be shown on my blog (as well as on yours) and also on a group Pinterest board! Later in the month, I'll announce a giveaway of a few of my hearts, to readers who have commented during the month. You're welcome to contribute one heart during the month of February, or as many as you'd like. 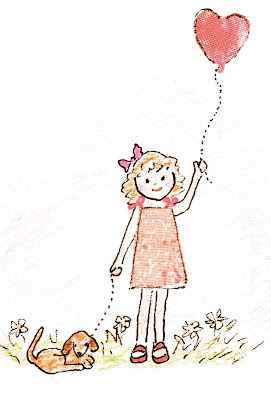 I'm hoping to fill my blog with hearts and friendship this month! I'd love you to join in! !